It's New Comic-book Night once again... and this week, I finally have a new comic to actually buy (most of the comics I buy are digital, so I don't need to buy them on "the night" or go to the comic shop). Actually, I had expected two comics tonight -- Batgirl 19 and Katana 3, but for some reason, Katana was not published this week. Either it was delayed, or the poor thing has been canceled already (not an unprecedented move for +DC Comics these days). On the other hand, I saw a solicit for Katana 6, so my guess is, there was just some sort of delay, or perhaps +DC Comics decided to change the publication week to match JLA and the other JLA-based books like Vibe. In any case, that means the only new book for me to get on NCN this week was Batgirl. I haven't read it yet, but I'm already ecstatic, because Gail Simone is back! This means Batgirl will probably return to the top of my favorite comics list, since it has suffered badly in the 2 months Gail was gone. Note to DC: Gail Simone is Batgirl. Do not take her off this book, ever again. If I were running things, whoever fired Gail would have been fired instead. Along with Batgirl 19, I also picked up two more trade paperbacks involving Supergirl's 3rd incarnation (the second version of Kara Zor-El) -- Supergirl and The Legion of Superheroes. The two TPBs the comic shop had were "Adult Education" (the second of four trades starring the Girl of Steel in the 31st century) and "Dominator War." One TPB remains ("Quest for Cosmic Boy") but my comic shop did not have it, so that will have to be ordered at some point. Following this, there are two more TPBs of this version of the Legion, which I will also have to order, since the comic shop has very little "Legionalia." 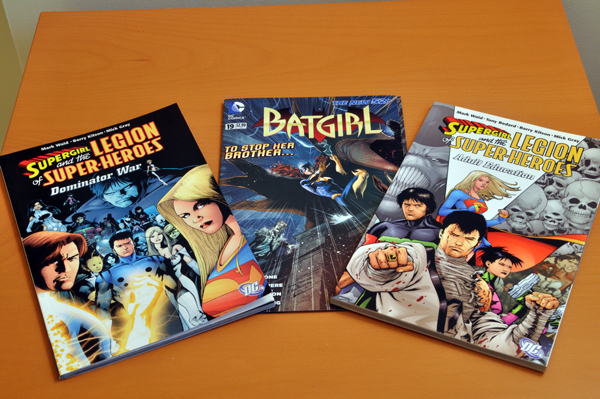 What I really wanted to pick up tonight was Supergirl: Identity, which is the third TPB in the third Supergirl series. Unfortunately, that seems to have sold out not only of my comic shop (and it was there three weeks ago -- ARGH! ), but also of everywhere else for some reason. I'm not sure why there is suddenly a "run" on that particular TPB, but I may have to wait a while before I can continue collecting that series -- or else try to buy the individual comics, which are issues 10-19 of that series. It's an option (they are not that expensive), but I'm really trying to stick with TPBs this time around (I would have for the Peter David series but there really aren't any TPB versions of that one). Well, that's it for NCN this week. Next week there should be three or four new titles to pick up (JLA, JL, Supergirl, and possibly Katana).